The Sweet Line makes totally sweet, custom hand embroidered clothing for children, and they offer many organic styles. If you are not the crafty type that can do embroidery, or you simply don’t have the time, the Sweet Line can give your children’s clothing that special touch. The t-shirts are made from 100% interlocked organic cotton, which is the softest organic cotton I have ever felt. Early childhood educators suggest that using a child’s name is the first place to begin teaching your child the alphabetic principle. Learning name recognition, as well as the letter names and sounds of one’s own name, is the logical and most appropriate way for children to learn their letters. 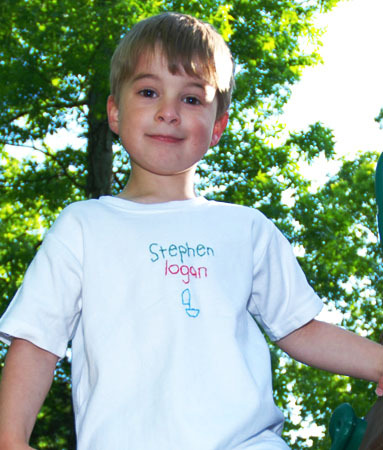 Custom items brandishing your child’s name, such as Sweet Line’s custom organic cotton embrodery t-shirts, give your child lots of opportunity to experience their name. I still remember when my daughter was two-years-old and learned to spell her name from a custom clock her grandfather gave her. My son was so excited to see his name on his Sweet Line shirt. Not only can you customize the shirt with your child’s name, you can also request a special shape or object with your order. Personalized items are just one more way you can make your child feel special during these special years of early childhood. I found this post whilst surfing for organic products. I would just like to mention that having your child’s name on a tee-shirt or anything that could be read by anyone can be somewhat dangerous. I have read that your child’s name can be used by someone trying to take them, as in “Hi Johnny, I’m your mommy’s friend and she asked me to come pick you up,” and the child is more likely to believe the person because he knows his name. Just wanted to point that out; they are cute shirts. Erinne, I’ve heard that too. I think that for toddlers that stay close to mom or dad, it is fine. I guess you just pick when the safest times are to wear such a shirt based on your days activities. Crazy world we live in. Here is a site I found where you can get tons of organic t-shirts at a wholesale price. I love the idea of getting a blank organic t-shirt then being able to design it the way you want to make it fashionable.